Additional research provided by Paul Branch. 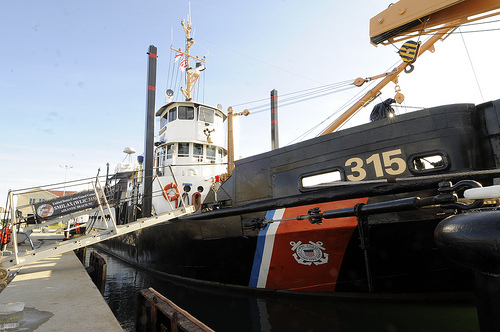 The U.S. Coast Guard has figured prominently in North Carolina's maritime history; it has long been traditional in many coastal communities for young men to follow their fathers and grandfathers in a Coast Guard career. For more than 40 years local seafaring men served with distinction in the chain of U.S. Lifesaving Service stations running the length of the North Carolina coast from Wash Woods to Oak Island prior to the 1915 formation of the U.S. Coast Guard from the union of the Lifesaving Service with the Revenue Cutter Service. By that time most of the original lifeboat stations had been replaced by larger structures designed to accommodate crews on call throughout the year. Just as steam was gradually replacing sail on the merchant vessels plying shipping lanes off the coast, motors replaced oars in the Coast Guard. In World War I, Coast Guardsmen responded to distress calls from ships attacked by German submarines, even as the U-boats cruised nearby. After the war the Coast Guard maintained its shore stations, the choice of names most often dictated by prominent geographic features. There were the inlet stations (Caffeys Inlet, Oregon Inlet, New Inlet, Hatteras Inlet, and Bogue Inlet), the cape stations (Cape Hatteras, Cape Lookout, and Cape Fear), and the hill stations (Pennys Hill, Poyners Hill, Paul Gamiels Hill, Kill Devil Hills, and Creeds Hill). Some were named for nearby communities, such as Wash Woods, Kitty Hawk, Nags Head, Chicamacomico, Little Kinnakeet, Big Kinnakeet, Ocracoke, and Portsmouth, or for islands, such as Bodie Island, Pea Island, and Oak Island. Even those fitting into no particular category received distinctive names (Gull Shoal, Durants, Core Banks, and Fort Macon). By the late 1930s local men no longer exclusively manned the area stations, and North Carolina Coast Guardsmen were widely dispersed throughout the country. The Fort Macon Coast Guard Station originated in 1904, when the U.S. Treasury Department, attempting to close gaps in the Lifesaving Service's coverage of the North Carolina coast, built a station on the old Fort Macon Military Reservation. It was situated on Bogue Banks to protect Beaufort Inlet. Although Fort Macon State Park was created when the state acquired the land by congressional act in 1924, 22.6 acres remained in the hands of the Treasury Department to maintain the Coast Guard station. Since World War II the station has acquired base status by expanding its facilities and providing services beyond its original lifesaving role, such as aid to navigation, marine law enforcement, and drug interdiction. In the early 2000s it employed about 200 active personnel and many others. During World War II native North Carolinians in the Coast Guard performed a wide range of duties, including serving as coxswain on landing craft used to deposit troops and tanks on the beaches of Anzio and Iwo Jima. Meanwhile, a major Coast Guard air base was established at Elizabeth City in the northeastern part of the state. Throughout the war this new air wing regularly joined with personnel from the shore stations in response to crews of tankers and freighters sunk by German submarines. The World War II experience, combined with a decline in coastal shipping and the introduction of radar, loran, sonar, and other sophisticated warning systems, resulted in a total restructuring of Coast Guard facilities along the North Carolina coast. One by one, the old shore stations were decommissioned, with only those near the inlets left in service. At the beginning of the twenty-first century Coast Guard cutters operating from the remaining stations as well as Coast Guard aircraft from the Elizabeth City base, which employed about 900 active members and many civilians, were able to respond more quickly to disasters at sea. Karl Baarslag, Coast Guard to the Rescue (1937). Joe A. Mobley, Ship Ashore! The U.S. Lifesavers of Coastal North Carolina (1994). Nell Wise Wechter, Mighty Midgetts of Chicamacomico (1974). The CGC Smilax, the Coast Guards oldest cutter at Fort Macon, 2011. 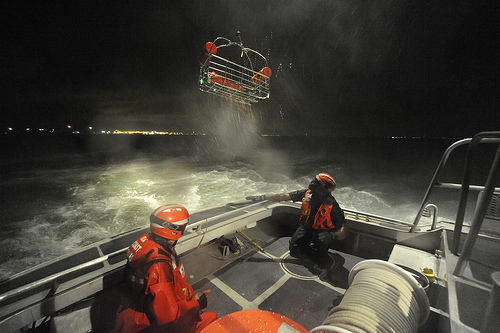 Image courtesy of the U.S. Coast Guard. Available from http://www.flickr.com/photos/coast_guard/5740085909/ (accessed November 29, 2012). Two crewmembers from Coast Guard Station Portsmouth, Va., ensure the basket is clear of the vessel as it's being hoisted by an MH-60 Jayhawk helicopter crew from Coast Guard Air Station Elizabeth City, N.C. for training, Monday, July 30, 2012. Image courtesy of the U.S. Coast Guard. Available from http://www.flickr.com/photos/coast_guard/7728052292/ (accessed November 29, 2012).